Our beloved Clurie lived her life fully and completely right up to the moment she left us suddenly on a Sunday morning in the kitchen of her own home. She was born in Bryn Mawr, Pennsylvania to Katherine Biays Williams of Hancock, Maryland and Alfred Leslie Warwick Williams ("Wiggs") of Buckinghamshire, England. Kay was a playwright and Wiggs an inventor. After attending Radcliffe College, Clurie won the Sculptural Drawing Award at the Museum School in Boston and went on to teach art at the Park School of Brookline, MA. She met her husband Warren Bennis in Boston while he was teaching at MIT and together they lived in Beacon Hill, Calcutta, Buffalo, Cincinnati, and Aspen. She and Warren shared the ability to bring people together in a way that nurtured human connection so that all who entered their world left with an enormous sense of possibility. Clurie made this happen with absolute ease, big pots of chili with crusty bread, and elegance. Their house was always full of ideas, art, chaos, playfulness, and generative conversation that radiated out into the world. After their marriage ended, Clurie stayed in Aspen working for environmental causes and continued to house actors and bohemians, while raising their three children. She returned to Cleveland after her own mother's death in 1994 to "clean out the boxes of clippings" and was immediately pulled into the warm embrace of the vibrant community. Twenty-three years later, Fairhill Road was still her home. No matter where she was, Clurie planted seeds of love in hidden gestures, offering a ride, a meal, a home, in order to support others in bringing beauty to the world. She saw us all with pure acceptance and without desire to alter. More than anything, Clurie wanted to be of use. She was both aesthetic and ascetic: she recycled everything, but could not part with beautiful postcards; she browsed second-hand shops, sometimes buying back her own jersey black pants; she would not think of eating until she saw a sun-warmed, red tomato. She said 'yes' to every concert, party, play, every invitation, every excursion, every chance to see something new, every book, every article, every cup of tea, every finger of gin, every late night, every brisk walk, every chance to be a part of the lives of others. We could not have asked for a more fascinating person to have given us the gift of her view of the world. She is irreplaceable but the gifts she gave cannot help but leave us all to flower more abundantly and more sweetly in her wake. 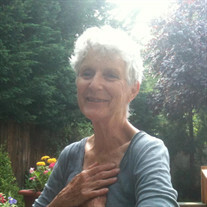 Beloved mother of Katharine Bennis, her husband, Hallam Movius of Charlottesville, VA, and their children Luke and Anya; John L. Bennis of Costa Mesa, CA, and his daughter Devin; and Will M. Bennis and his wife, Lea, of the Czech Republic, and their children Daniel, Adam, and Hana; and beloved sister of Leslie W. Mills of Hancock, MD. For those who wish to make contributions, she was passionately committed to the Cleveland Institute of Music and CityMusic Cleveland. Memorial services will be held January 20th at 5:00 PM at Kulas Hall, Cleveland Institute of Music, 1615 Hazel Dr., Cleveland, OH 44106.